Slice of Saugatuck Festival organizer Matthew Mandell looks at the Saugatuck River from the boardwalk of the new Saugatuck Center development. Walking the "slice" is a ritual for Matthew Mandell. Some days, that routine takes the Saugatuck area resident and Representative Town Meeting member down Riverside Avenue where he may stop in for a cup of coffee at Doc's Cafe. On other occasions, he may swing by Desi's Corner at the intersection of Riverside and Railroad Place for a newspaper or venture down the street for a Greek spanakopita delicacy at Commuter Coffee. These trips, as well as his visits to other Saugatuck businesses, all take place within a half-mile area delineated by Riverside Avenue, Railroad Place and Saugatuck Avenue. Together, these borders create a tract whose shape resembles a slice of pizza. Mandell hopes to showcase the slice to a wider audience with "Slice of Saugatuck," a new festival that he has organized that will take place Saturday afternoon in the Saugatuck section of Westport. During the festival, 20 dining establishments will serve free fare from their menus, while several retailers will offer product demonstrations. "The whole idea is to show what the area has got and bring people down to Saugatuck," he added. "It has a different look and feel to it than the rest of Westport. It's a great place." The launch of the festival also reflects Saugatuck's re-emergence as a vital commercial center bustling with new development and increasing prominence in town for evening activities. Saugatuck's recent growth arguably represents its most successful effort to forge a cohesive neighborhood identity since the 1958 opening of Interstate 95, which cuts through the neighborhood at Saugatuck and Riverside Avenues and spans the adjacent Saugatuck River. Construction of the highway forced demolition of dozens of Saugatuck homes, an impact that fractured the neighborhood's social fabric, said town historian Allen Raymond. "It was catastrophic," he said. "That was basically the end of Saugatuck. Before then, the kids used to run from house to house and it didn't matter who lived there -- all the houses were open to everybody. It was one wonderful community." In addition to I-95's encroachment into the area, Saugatuck also includes Westport's main Metro-North train station, which sometimes overshadows outside perceptions of the neighborhood. But a new mixed-use project overseen by the development arm of the Saugatuck-based energy company, Gault Inc., seeks to take advantage of the area's transportation links. Construction of the first stage of the "Saugatuck Center" development was completed earlier this year. Two new buildings on Riverside Avenue house the water sports store, Downunder Kayaking; a new butcher shop, Saugatuck Craft Butchery, and 5,000 square feet of office space occupied by firms offering financial services. 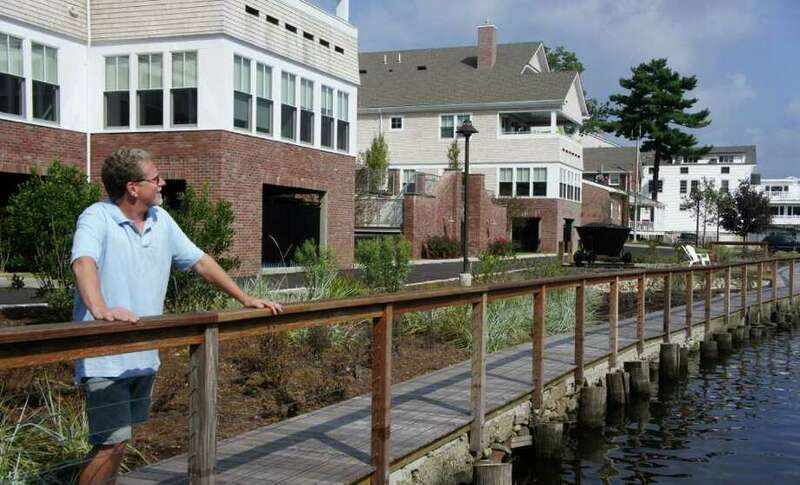 The development also includes six apartments, as well as a boardwalk and marina on the Saugatuck River. A restaurant helmed by the chef of the Post Road East eatery, Le Farm, is scheduled to open at the site later this fall. "We wanted to bring a neighborhood and village feel back to Saugatuck," said Gault President Sam Gault. "The vision was to have a true smart-growth, mixed-use project where you have people working and utilizing the retail shops as well as people living there." Gault's company, a family-run enterprise whose Saugatuck roots date back to 1863, is also a sponsor of Slice of Saugatuck. Saugatuck Center will next expand through the renovation of buildings on Ketchum Street and Franklin Street. With a total footprint of approximately 24,000 square feet, those buildings will likely house marketing and finance companies, according to Gault. Construction for this second phase will begin within the next few weeks and will finish by March 2012, he said. In the final stage, Saugatuck Center will add in late spring or early summer 2012 five new buildings on the west side of Riverside Avenue that will encompass 21 apartments and 4,000 square feet of retail space. Situated on the Saugatuck River and within sight of the Metro-North train station, Saugatuck Center's location stands out as one of its key assets, said Downunder owner Kim Beaumont. "We needed to have an on-water location; that was huge," she said. "Being near the station is great too. We've had a lot of business from people who come here on the train." Eric Johnson, owner of the Riverside Avenue fishing and boating store, Westport Outfitters, said he has also noticed increased interest in Saugatuck since his store relocated there from Norwalk in 2009. "You can walk from business to business, and look at the menus and products and services and then decide where you're going to eat," he said. "Saugatuck now is a destination. From a business standpoint, that is so valuable." Growing recognition of the area has also prompted businesses such as Commuter Coffee to seek to expand their customer base. The Railroad Place breakfast and lunch establishment, which normally relies on word-of-mouth advertising, has signed up as a sponsor of Slice of Saugatuck. "Most of our customers are commuters, so if you don't use the train, you probably won't see us," said Commuter Coffee's manager, Fred Whelan. "But with the revitalization going on in Saugatuck, we're hoping to get a little more exposure." Saugatuck, in particular, has emerged in recent years as a locus of dining and after-hours activities in Westport. The July arrival of celebrity chef Mario Batali's Tarry Lodge Enoteca and Pizzeria on Charles Street highlighted this trend. Within a half-mile radius of that restaurant are a clutch of other dining establishments, including the Mansion Clam House, Black Duck Cafe, Tutti's, Julian's Brick Oven Pizza, Tarantino's, Mario's Place, Viva Zapata and Dunville's. "There's a good mix of restaurants in Saugatuck right now. I think it's the right amount," said Dunville's owner, Steve Carpentieri. "If someone can't get a table at Tarry Lodge, someone there might send a customer our way and say, `Try the steak at Dunville's.' And we'd do the same for them and other restaurants." The flourishing dining scene in Saugatuck coincides with an intense push by the town's Planning and Zoning Commission to foster more nighttime vibrancy throughout the town. Those efforts have focused on downtown Westport, about a mile-and-a-half up the Saugatuck River from Saugatuck. "Everybody is worried about how to revitalize downtown," Mandell said. "Downtown is a mall. I say Saugatuck is already revitalized and people should come here." Several major development projects, such as the redevelopment of the property that now houses the Westport Weston Family Y, are also planned downtown. Gault, however, said he believes that both sections of town could thrive. "I don't think we as developers in Saugatuck are competing with downtown," he said. "We like to view ourselves as a complement to downtown." Taking a walk down Riverside Avenue on a recent weekday, Mandell outlined his hopes for Saugatuck beyond the festival. He said he favored adding new businesses, such as a small grocery store or a drugstore. In contrast, he said that more large-scale development, such as a parking garage at one of the train station's commuter lots, would be detrimental. "I'm looking 50 years out," he said. "If we still have a small-town character and are a unique community, while everyone else has gone urban and grown bigger, then everyone will want to come here." Mandell added that he would also like to see the return of the Festival Italiano, a summer staple of Saugatuck for almost 30 years until its cancellation earlier this year. Slice of Saugatuck's arrival could also mark the start of closer collaboration among Saugatuck merchants. Johnson said that Westport Outfitters and Downunder plan in coming months to jointly organize kayak and fishing tours or seminars. "This festival will be a barometer. I'm optimistic," he said. "The intentions are good, and I think we have enough businesses to support it." While I-95 still cuts through Saugatuck, Raymond also expressed confidence the neighborhood is beginning to recapture the close-knit ambiance that prevailed before the highway's intrusion. "I think this area is being rejuvenated," he said. "That really is the word that I would use to describe what's going on right now." The potential for rebuilding the community is there." A vibrant 'Slice' of Westport life The Slice of Saugatuck Festival will take place in Saugatuck on Saturday, Sept. 17 from noon to 3 p.m. Twenty dining establishments will offer free tastings, while several Saugatuck retailers will offer product demonstrations at Luciano Park and at the Saugatuck Center plaza on Riverside Avenue. The Westport Fire Department will offer tours of its firehouse on Riverside Avenue. Several musical acts will also perform at venues such as the Saugatuck Center plaza, Rizzuto's Wood-Fired Kitchen and Bar, and next to Mario's Place on Railroad Place. For more information, visit http://www.westportd1.com/saugatuck/.